Canadian Financial DIY: CP Rail vs CN Rail - Pricing in perfection? Ever since the big shareholder battle and the installation of Hunter Harrison as CEO of CP Rail (TSX: CP), CP stock has been on tear, with returns far outstripping those of rival CN (CNR). Is this justified, should I be riding the rails with CP instead of my well-established holding in CN? The short answer is, I don't think so. It sure looks like CP shareholders are fully paying in advance for business improvements that meet or exceed present performance of CN, which is termed the best-run railway in North America. No doubt tremendous improvements are taking hold at CP, as evidenced by CP's most recent quarterly results. But the numbers below, which include the latest results despite some sources that have not yet updated their databases weeks after the results were released (I ignored those), say to me that CP still has a lot of catching up to do. CN is green / better almost everywhere, except for profit improvement. Management is getting richly rewarded for the job they are supposed to carry out in future. The cart is before the horse. Named Executive Officer (which includes CEO Harrison and the other top execs) pay is up enormously since the doldrum years of 2007 and is now a much bigger slice of the pie than at CN. It's not just Harrison receiving platinum compensation, it's all the execs. CP's execs are about 85% over-paid. It's like paying one of your kids more to clean her room when another kid doesn't get anything because her room is already clean. Business performance measures still lag CN's by a lot. Whether you look at ROE, ROA, Operating or Net Margins, Operating Ratio, Revenue per employee (and different data sources give frustratingly different numbers for the supposed same metric), CN is still far ahead of CP. CP is also more levered / riskier with its higher debt load. Valuation of CN is much less rich than CP. The ratio of market Price to present Earnings, Book Value, Sales, Cash Flow or EV to EBITDA, all point to a cheaper CN. There is evidently an expectation of significant improvements to come at CP. How much improvement is expected? It looks like pretty much complete catch up to CP, as suggested by the highlighted cells. Expectations of sales growth are not be the source of CP's potential advance, it is all in profitability gains, as analyst Sales and Earnings estimates testify. But CN isn't standing still, it has been increasing dividends steadily and is still much ahead of CP's and it is forecast to grow Sales and Earnings. 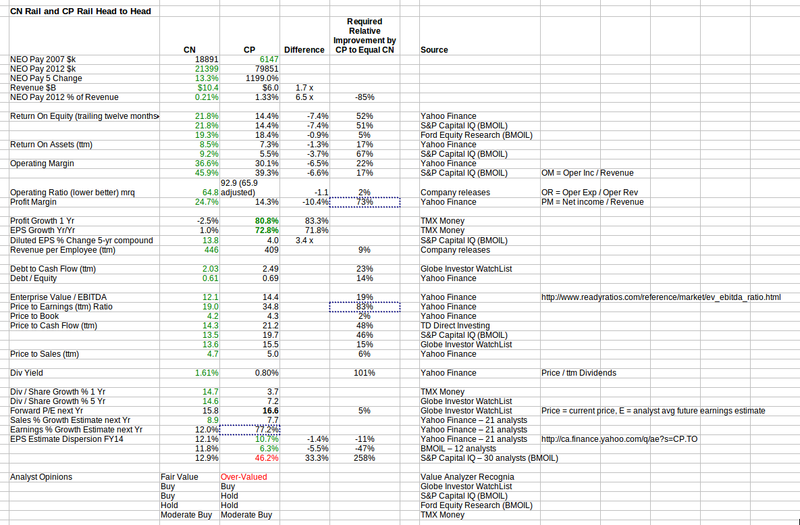 The overall combination of various sources on analyst recommendations seems to indicate CP more over-valued than CN. Blogger Sylvia Brunner's more thorough run-through of CN's numbers concludes that CN itself is on the pricey side. But like her I will continue to hold it. Good luck to CP shareholders. Here's hoping all goes perfectly according to plan as you seem to expect. Meantime, for CEO Harrison congrats on picking a nice bet - heads, you win and tails, you win too!